Will Virtual Reality Experiences for Brands Rival Super Bowl Ads? Will virtual reality soon replace the almighty Super Bowl spot? For anyone who hasn't tried VR, it might sound like a crazy idea to consider. When it comes to the race for the highest level of attention from the largest number of eyeballs, marketers have long sought to make well-produced, expensive ads the star of the game. But for brands already creating experiences within the burgeoning intersection of tech and advertising, some say VR will soon be more than just a Hail Mary. In fact, some brands have already reached Super Bowl-size audiences with their VR experiences. Ahead of the NBA All-Star Game in Toronto earlier this year, Mountain Dew partnered with Google and Tilt Brush to create an experience featuring NBA stars and local Toronto artists painting in VR. The experience picked up around 150 million views, said Adam Harter, vp of marketing and cultural connections at Pepsi. In other words, "Super Bowl-like" scale. Speaking at a video conference in New York on Monday, Harter said VR is becoming an "arms race" for creating experiences that consumers actually care about. While Harter wouldn't reveal how much Pepsi spends on VR, he said Pepsi spends about 70 percent of its marketing budget on its current marketing channels, 20 percent on what's next and another 10 percent on what's new. "We believe that this is an ultimate expression of a brand experience that you can create in VR," Harter said. "It's completely immersive. We believe that if you can create an emotional connection with the consumer, you will hook them, you will make them fans of your brand. And I don't think that any other experience other than VR can create an experience that people want to share more." Speaking on the panel at New York TV and Video Week with Harter was Doug Coleman, a national marketing manager at Toyota USA. Coleman said Toyota has seen big gains from its early experiments with VR. 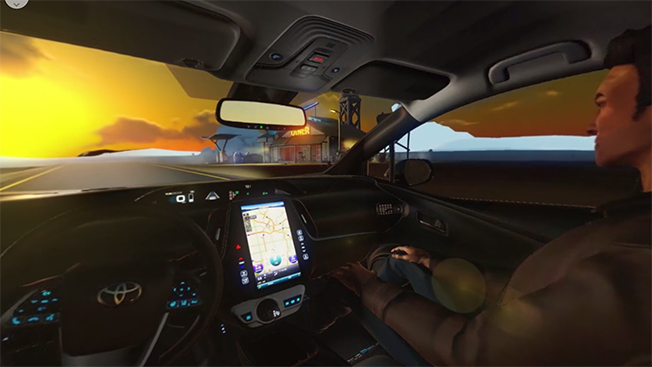 For the new Prius Prime, the car manufacturer created an animated VR experience that lets users sit inside of a new car as it cruises through a city. But while brands trying VR early can capitalize on the newness of the medium for publicity, that will soon wear off, he said. That will force VR to strive for the same level of quality as Super Bowl ads. While VR is gaining on the Super Bowl in reach and quality, the two definitely have one thing in common. "The only way the Super Bowl and VR are similar right now is they both cost a lot," Coleman said. But how much do brands really pay for these one-of-a-kind VR experiences? Ryan Pulliam, co-founder and CMO of VR content creation studio Specular Theory, said she normally tells clients to budget between two and three times as much for a VR experience than they do for a typical video project. Pulliam—whose company has worked with brands such as Jeep, Interscope Records and Sony—said budgeting a VR project is like budgeting a movie without first knowing the script. "We're going from an information age to an experience age," she said. "You're creating real, first person memories."